Much like many others in the retail industry, our year kicks off with bang at NRF’s 101st Annual Convention & EXPO in New York. On our last blog post, we touched on the many interactive activities we will have at our booth (2921), and we are truly excited to showcase our technology to the movers and shakers in our line of work. The true benefit at an event like “Retail’s Big Show” is the exchange of new ideas, something that is inevitable when you gather a large group of innovators. NRF’s flagship conference has excelled at this type of exchange in recent years, and this year’s show will prove no different. With keynote speeches by President Bill Clinton and Executive Vice President of Advertising, Marketing and Corporate Communications at Ralph Lauren Corporation, David Lauren, the show is guaranteed to provide insight and knowledge about the direction of the industry. With the exchange of new ideas in mind, we invite anyone attending the show to stop by our booth. We are truly passionate about enhancing the in-store customer experience through the correct application of technology and would be interested hearing your ideas surrounding customer service. And, with Mark Ryski – author of Conversion: The Last Great Retail Metric – onsite, you know he will share great insight about retail analytics and how it can positively affect profitability. 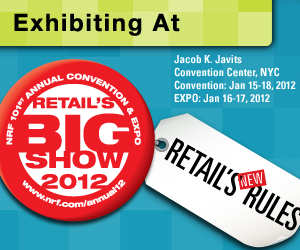 NRF’s 101st Annual Convention & Expo is almost upon us. We will be at booth #2921 and we hope to see you there!